The Chinese economy's meteoric rise over the last few decades has been one of the biggest stories in economics; however, China’s growth has begun to slow in the last few years as authorities have begun to transition the economy from a manufacturing-based economy to a services-based economy. Thus, other economies have begun to post larger growth rates, in recent years. In this piece, we compile a list of the top 15 fastest growing economies in 2019 according to our Consensus Forecasts from over 1000 sources. Ethiopia is the second most populous country in Africa and is a one-party state with a planned economy. For more than a decade before 2016, GDP grew at a rate between 8% and 11% annually. This growth was driven by government investment in infrastructure, as well as sustained progress in the agricultural and service sectors. More than 70% of Ethiopia’s population is still employed in the agricultural sector, but services have surpassed agriculture as the principal source of GDP. The state is heavily engaged in the economy. Ongoing infrastructure projects include power production and distribution, roads, rails, airports and industrial parks. Key sectors are state-owned, including telecommunications, banking and insurance, and power distribution. Under Ethiopia's constitution, the state owns all land and provides long-term leases to tenants. Ethiopia’s foreign exchange earnings are led by the services sector - primarily the state-run Ethiopian Airlines - followed by exports of several commodities. While coffee remains the largest foreign exchange earner, Ethiopia is diversifying exports, and commodities such as gold, sesame, khat, livestock and horticulture products are becoming increasingly important. Manufacturing represented less than 8% of total exports in 2016, but manufacturing exports should increase in future years due to a growing international presence. Economic growth cooled in fiscal year 2017, as production in the important agricultural sector increased only modestly and the pace of expansion in the industrial sector softened. The slowdown in the industrial sector was chiefly driven by a moderation in infrastructure spending, as the government reduced capital imports in an attempt to alleviate dollar shortages. That said, the banking sector continued to enjoy good financial health. In early February, the country’s mines and petroleum minister announced the forthcoming adoption of a comprehensive reform of the mining and oil sectors. Reflective of the government’s attempts to open up the economy, the reform will aim to improve the fiscal regime in order to attract more foreign investment and thus also ease dollar shortages. Economic activity should pick-up in FY 2018, powered by an improving business environment and solid public investment spending. A weak external liquidity position, however, clouds the outlook. FocusEconomics panelists see the economy growing 8.1% in FY 2018, which is unchanged from last month’s forecast, and 7.9% in FY 2019. Rwanda is a rural, agrarian country with agriculture accounting for about 63% of export earnings, and with some mineral and agro-processing. Tourism, minerals, coffee, and tea are Rwanda's main sources of foreign exchange. Despite Rwanda's fertile ecosystem, food production often does not keep pace with demand, requiring food imports. Energy shortages, instability in neighboring states, and lack of adequate transportation linkages to other countries continue to handicap private sector growth. Rwanda has achieved rapid growth over the last decade, thanks to the implementation of effective economic development and poverty reduction programs. Today the country is one of East Africa’s fastest-growing economies, with 70% of the workforce in the agricultural sector, which remains the backbone of the economy. Its top exports are gold, tea and petroleum, with Kenya and Democratic Republic of Congo the biggest export destinations, followed by China, Malaysia and the United States. The government is finalizing the National Strategy for Transformation, aimed at economic, social and governance transformation toward the East African Community (EAC) Vision 2050. Bangladesh's economy has grown roughly 6% per year since 2005 despite prolonged periods of political instability, poor infrastructure, endemic corruption, insufficient power supplies, and slow implementation of economic reforms. Although more than half of GDP is generated through the services sector, almost half of Bangladeshis are employed in the agriculture sector, with rice as the single-most-important product. Garments are the backbone of Bangladesh's industrial sector, accounting for more than 80% of total exports in FY 2016-17. The industrial sector continues to grow, despite the need for improvements in factory safety conditions. Steady export growth in the garment sector, combined with $13 billion in remittances from overseas Bangladeshis, contributed to Bangladesh's rising foreign exchange reserves in FY 2016-17. Recent improvements to energy infrastructure, including the start of liquefied natural gas imports in 2018, represent a major step forward in resolving a key growth bottleneck. The economy is likely to grow at a robust, but slightly slower, rate this fiscal year. Private consumption should continue to be underpinned by remittance growth, while strong government consumption and investment are also seen providing buffers. However, risks of natural disasters, a weak global trade environment and a struggling domestic banking system all cloud prospects. Our panelists expect GDP to expand 7.4% in FY 2019, which is unchanged from last month’s forecast, and 7.2% in FY 2020. India's diverse economy encompasses traditional village farming, modern agriculture, handicrafts, a wide range of modern industries, and a multitude of services. Slightly less than half of the workforce is in agriculture, but services are the major source of economic growth, accounting for nearly two-thirds of India's output but employing less than one-third of its labor force. India has capitalized on its large educated English-speaking population to become a major exporter of information technology services, business outsourcing services, and software workers. Nevertheless, per capita income remains below the world average. India is developing into an open-market economy, yet traces of its past autarkic policies remain. Economic liberalization measures, including industrial deregulation, privatization of state-owned enterprises, and reduced controls on foreign trade and investment, began in the early 1990s and served to accelerate the country's growth, which averaged nearly 7% per year from 1997 to 2017. Economic momentum is expected to remain steady in FY 2019. Strong government spending should support growth, as could a possible sustained lull in oil prices, although weak public finances and global trade protectionism could weigh on prospects. Our panelists expect GDP growth of 7.3% in FY 2019, which is unchanged from last month’s estimate, and 7.3% again in FY 2020. Cote d'Ivoire is heavily dependent on agriculture and related activities, which engage roughly two-thirds of the population. Cote d'Ivoire is the world's largest producer and exporter of cocoa beans and a significant producer and exporter of coffee and palm oil. Consequently, the economy is highly sensitive to fluctuations in international prices for these products and to climatic conditions. Cocoa, oil, and coffee are the country's top export revenue earners, but the country has targeted agricultural processing of cocoa, cashews, mangoes, and other commodities as a high priority. Mining gold and exporting electricity are growing industries outside agriculture. The economy should remain in rude health this year, bolstered by upbeat private consumption and increased fixed investment. In addition, exports are expected to rebound this year, on the back of increased agricultural output and stable prices for cocoa. Political turmoil ahead of the 2020 presidential election remains the key downside risk, however. Our panel sees growth at 7.1% in 2019, which is unchanged from last month’s forecast, and at 6.9% in 2020. Cambodia has experienced strong economic growth over the last decade; GDP grew at an average annual rate of over 8% between 2000 and 2010 and about 7% since 2011. The tourism, garment, construction and real estate, and agriculture sectors accounted for the bulk of growth. Around 700,000 people, the majority of whom are women, are employed in the garment and footwear sector. An additional 500,000 Cambodians are employed in the tourism sector, and a further 200,000 people in construction. Tourism has continued to grow rapidly with foreign arrivals exceeding 2 million per year in 2007 and reaching 5.6 million visitors in 2017. Mining also is attracting some investor interest and the government has touted opportunities for mining bauxite, gold, iron and gems. Textile exports, which accounted for 68% of total exports in 2017, have driven much of Cambodia’s growth over the past several years. The textile sector relies on exports to the United States and European Union, and Cambodia’s dependence on its comparative advantage in textile production is a key vulnerability for the economy, especially because Cambodia has continued to run a current account deficit above 9% of GDP since 2014. The garment and tourism sectors are expected to drive the economy this year, further fueled by Chinese fixed investment and public consumption. Nevertheless, Cambodia could lose its preferential market access to the EU, which would hurt the garment sector, while the slowdown in China could affect tourist arrivals. Our panelists expect the economy to expand 6.7% in 2019, which is unchanged from last month’s forecast, and 6.5% in 2020. Since Myanmar began the transition to a civilian-led government in 2011, the country initiated economic reforms aimed at attracting foreign investment and reintegrating into the global economy. Myanmar’s economic growth rate recovered from a low growth under 6% in 2011 but has been volatile between 6% and 7.2% during the past few years. Myanmar’s abundant natural resources and young labor force have the potential to attract foreign investment in the energy, garment, information technology, and food and beverage sectors. The government is focusing on accelerating agricultural productivity and land reforms, modernizing and opening the financial sector, and developing transportation and electricity infrastructure. The government has also taken steps to improve transparency in the mining and oil sectors through publication of reports under the Extractive Industries Transparency Initiative (EITI) in 2016 and 2018. Growth should be robust going forward, although the slowdown in China could drag on activity. The potential loss of preferential market access to the EU, persistent twin deficits and the resurgence of violence in the Rakhine state pose further downside risks to the outlook. The panel sees growth at 6.7% in 2019, which is down 0.2 percentage points from last month’s forecast, and 7.1% in 2020. Economic growth is set to remain strong in 2019 on the heels of solid energy exports, continued infrastructure spending, and higher FDI inflows. Nevertheless, vulnerability to external shocks, persistent twin deficits and a slowdown in China—a key trading partner—represent the principal risks to the outlook. FocusEconomics Consensus Forecast panelists expect GDP to expand 6.7% in 2019, which is unchanged from last month’s forecast, and 6.8% in 2020. Vietnam is a densely populated developing country that has been transitioning since 1986 from the rigidities of a centrally planned, highly agrarian economy to a more industrial and market based economy, and it has raised incomes substantially. Vietnam has a young population, stable political system, commitment to sustainable growth, relatively low inflation, stable currency, strong FDI inflows, and strong manufacturing sector. The economy should continue to grow at a robust, albeit weaker, pace in 2019, propelled by strong FDI inflows, a burgeoning role as a manufacturing hub in the region and solid domestic demand. However, a more challenging trade environment amid persistent Sino-American trade tensions and cyclical slowdowns in the U.S. and China, could dampen export prospects. FocusEconomics panelists project the economy expanding 6.6% in 2019, which is unchanged from last month’s forecast, and 6.4% in 2020. Strong public investment spending, solid credit growth and more favorable weather conditions should underpin growth this year. Higher infrastructure expenditure, however, could inflate fiscal and current account deficits, while weakening investor sentiment clouds the outlook. FocusEconomics panelists expect GDP to expand 6.3% in 2019, which is unchanged from last month, and 6.4% in 2020. The Philippines' economy has been relatively resilient to global economic shocks due to less exposure to troubled international securities, lower dependence on exports, relatively resilient domestic consumption, large remittances from about 10 million overseas Filipino workers and migrants, and a rapidly expanding services industry. The economy is expected to expand at a solid pace in 2019. Household spending should be buoyed by falling inflation, robust remittances, and a tighter labor market. Moreover, fixed investment and government expenditures, while expected to moderate from 2018, will continue to support growth. Slower growth in China and the region at large, and the ongoing Sino-American trade spat remain the main risks to the outlook. FocusEconomics panelists see GDP expanding 6.3% in 2019, which is unchanged from last month’s forecast, and 6.2% in 2020. Senegal has few natural resources and is heavily reliant on foreign assistance. It is highly exposed to rainfall variations and fluctuations in commodity prices, yet the World Bank considers it one of the most stable economies in Africa and one of West Africa’s key economic hubs. The country is a shipping and transport hub in the region and has one of the most developed tourism industries on the continent. Despite its economic stability and modest growth, major risks to the economy include twin fiscal and current-account deficits. Should the government continue its structural reforms, the economy is expected to remain relatively stable, however. Economic growth is set to decelerate this year on the back of previous efforts to tackle financial deleveraging and moderating global demand. However, fiscal and monetary easing are expected to cushion the economy against any sharp slowdown. Conversely, a further deterioration in relations between China and the U.S. is the main downside risk. 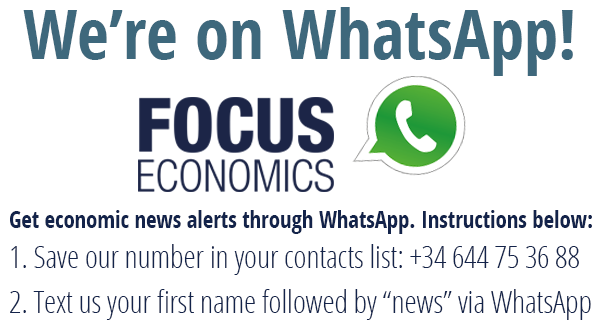 FocusEconomics panelists see the economy growing 6.2% in 2019, which is unchanged from last month’s forecast, before decelerating further to 6.0% in 2020. Growth should remain strong this year, powered by the Oyu Tolgoi copper mine expansion. However, the country is vulnerable to lower commodity prices due to slower global growth and a weaker Chinese economy, its main export market. FocusEconomics panelists see growth clocking at 6.2% in 2019, which is down 0.2 percentage points from last month’s forecast, and 5.9% in 2020. Agriculture accounts for about 20% of GDP and employs more than half of the workforce, mainly small landholders. Gold, oil, and cocoa exports, and individual remittances, are major sources of foreign exchange. Expansion of Ghana’s nascent oil industry has boosted economic growth, but the fall in oil prices since 2015 reduced by half Ghana’s oil revenue. Solid growth will carry over into this year, underpinned by robust household consumption and healthy investment activity growth. On top of that, the price outlook for Ghana’s key export commodities remains favorable, boding well for the all-important external sector. Nevertheless, volatile energy and financial sectors, as well as the uncertainty surrounding fiscal discipline after the IMF bailout program ends in April pose key risks to the outlook. FocusEconomics panelists expect the economy to expand 6.0% in 2019, unchanged from last month’s forecast, and 5.7% in 2020.